Who’s responsible for what happens? It’s so easy to believe that bad things happen to us. That disease and rejection and even the weather are not our fault, but are instead the result of forces beyond our control. We’d like to blame the economy and the teacher and the politicians for every door that isn’t open. That’s why people don’t like to hear about placebos and psychosomatic diseases. It’s no fun to believe that an illness might be in our head, because, the thinking goes, then it’s our fault, under our control, not a real disease. The very same instincts that want to believe that we’re powerless pawns also kick in (in reverse) when something good happens. Business people want to take credit for all of their success, ignoring the systems, the infrastructure and the cultural advantages that got them almost all the way there. 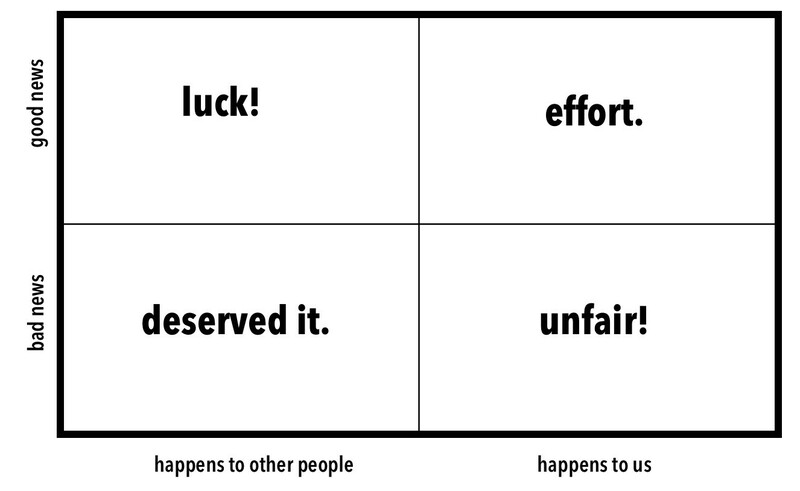 Luck is what we call it when good things happen to other people. Merit (or what we ‘deserve’) is what we call it when it happens to us. This immature ‘merit driven’ Ayn-Randian style self-reliance ignores all of the accidents of birth, of culture, of countless advantages that could hardly be our doing. And so, here we are stranded between two extremes. We have far more power over ourselves than we want to acknowledge. The power to make choices about what we eat, who we hang out with, how we balance the short term with the long. The power to connect, to lead, to refuse to accept the easy path. If we don’t like the weather today in May, it’s worth remembering we had the power to hold that picnic in July instead. Sure, weather isn’t up to us, but our planning is. If we find ourselves rejected again and again, perhaps we ought to figure out a different route. Rejection isn’t up to us, but our pitch and our plan are. And scientists keep reminding us that just about every illness has a component in our imagination and attitude. But, particularly when dealing with people who carry a burden we can’t even imagine, we have to acknowledge that so much is out of the control of each of us. It’s far easier to overcome our DNA than it is to overcome our culture. Is it possible to reverse the instinct, and decide that luck is what we call it when something good happens to us, and merit is when it happens to other people? Is it possible that culture and infrastructure advantages are in fact the causes of a lot of the good in our lives, and our choices (up or down) contribute more than we’d like to admit to all of it? In a situation where holding yourself accountable helps you do better work, avoid pitfalls and walk a little taller, remind yourself just how much self-determination you have. When trying to give someone else the space to contribute (perhaps even you), chalk up their insufficiency in the moment to the cultural determination that makes it truly difficult for some people to change their habits and their outcomes.